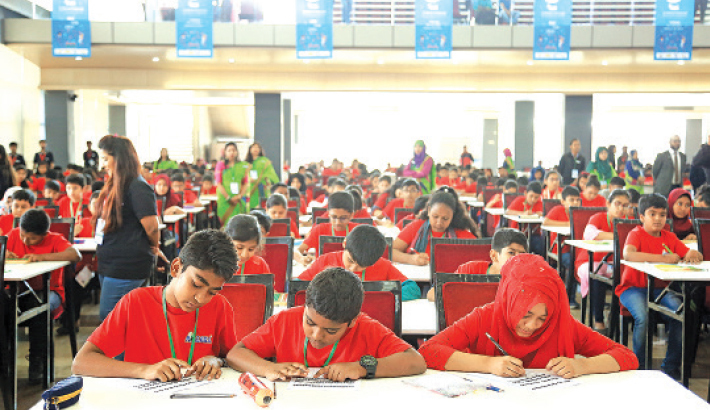 ALOHA Bangladesh organized its ‘12th National Level Abacus & Mental Arithmetic competition 2019’ on March 01, 2019 at Bashundhara International Convention City (ICCB) located in the capital. The day-long competition, one of its kind in Bangladesh, was participated by 2400 children from 600 schools across Bangladesh and 100 students from ALOHA Tripura, India. ALOHA Bangladesh has been organizing such competition in Bangladesh since 2008. The objective of this competition was to test the speed and accuracy of the children. The participants were asked to solve 70 complex sums within five minutes and majority of the students did it accurately within the due time. The programme was kicked off with the national anthem of Bangladesh. Loh Mun Sung, Founder Aloha Mental Arithmetic, inaugurated this event. After the welcome speech the children participated in the test in three different batches. The award ceremony took place in the second session. The chief guest of the event, Loh Mun Sung, handed over the prizes to the winners. Md. Ali Haider Chowdhury FCMA, Managing Director of ALOHA Bangladesh, delivered the welcome speech while Saiful Karim, Chairman of ALOHA Bangladesh, presided over the programme as the session chairman. Kiron Matwani (international director of Aloha), K Kumaran (Chairman of Aloha India) and Md. Anisur Rahman Shohag (Managing Director & Head, Averroes International School) were also present as special guests. “ALOHA Bangladesh is the first company to bring internationally recognized Aloha Mental Arithmetic competition to Bangladesh from Malaysia for the brain development of children aged between 4 and 14 years. It helps children build better concentration, self-confidence, sharper observation, keener listening skill, enhanced memory retention power, improved analytical skill and better imaginative skills. The programme will help children learn arithmetic in a fun way and do better in creative writing, social science, English, Bangla and other subjects,” said Md. Ali Haider Chowdhury, Managing Director of ALOHA Bangladesh. It is mentionable that the selected winners are going to participate in ‘Aloha International Competition 2019’ scheduled to be held at Foshan city in China. ALOHA, which stands for Abacus Learning of Higher Arithmetic, is a total brain development programme. It is an extra-curricular programme for school-going children which runs for two years and the programme is divided into 8 levels and each level lasts for three months. ALOHA Bangladesh has been operating since March 2006 and has so far enrolled students from more than 600 Bangla and English medium schools in the programme. ALOHA is an ISO certified learning system spreading in 35 countries including United States, Canada, Australia, New Zealand, China, India, Malaysia and Bangladesh.